Brandon has been a regular contributor to 4for4 since 2006. He's an experienced writer with a background in communication, business and alcoholic beverages. Follow Brandon Niles on Twitter: @2guysbrandon. I know this may sound silly, but practice makes perfect in fantasy football. Practice? Practice? I remember when I was twelve years old, sitting down in my parents' living room, trying to figure out who would be available for my first few picks. Each year would go by, and I'd try to predict further and further into the draft. Now I'm able to use the excellent draft preparation tools at 4for4 to practice the entire draft, otherwise known as mock drafting. If there's one rule of thumb when it comes to a fantasy draft, it's nothing will ever go exactly as you thought it would. The more you practice drafting, the better idea you'll have of who might be available, and to react to unforeseen circumstances, ultimately allowing you to maximize the value of your picks in any scenario. 4for4's Full Impact section includes customized draft simulation, customized cheat sheets, and many other draft-related tools. The Full Impact cheatsheets run off the official 4for4 player projections, and you can create a custom cheatsheet based on your league rules. You can run as many mock drafts as you'd like using your league's settings and scoring system. It doesn't stop there; during the season, Full Impact gives you customized weekly lineup help and more. No matter what type of league you're in, Full Impact gives you the edge. 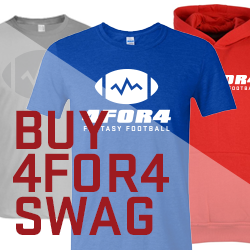 A subscription to 4for4 also gives you a FREE copy of Draft Analyzer web (mobile) and desktop versions (a $30 value), which is a cutting-edge draft tool. I've used it multiple times, and now I don't need to do my own simulations. I recommend that everyone try it out for an absolutely great simulation and to help with the 'practice makes perfect' philosophy. Both the web and desktop versions come with 4for4’s award-winning projections and include personalized draft recommendations. The mock drafts can be done in minutes, and the software also grades your draft for you after you're finished. You'll know right away how well you did in relation to the other simulated and user-controlled teams. For those of you who are like me and timid when using new software, John Paulsen has put together an easy-to-follow walkthrough that makes practicing for your upcoming draft easy! Full Impact and Draft Analyzer are highly recommended, but you should also consider doing at least one mock on the website that will host your draft. The mock draft will exactly resemble what the actual draft on the site will be like, including the draft room, pick timer, player listing order, and everything in between. 4for4's Multi-Site ADP Tool compiles Average Draft Position (ADP) data from several different sites. This data will give you an idea of which players might be available each round of your draft based on a typical fantasy draft. The ADP Draft Planner takes draft preparation to a new level, leveraging real draft data from MyFantasyLeague to provide real-world availability for players at virtually any point in the draft. Wondering which TEs are likely to be available with the 10th pick in the 7th round? The ADP Draft Planner can tell you! On the surface, I used to think that practicing for drafts was just a fun way to pass the time, as the seemingly endless months pass before fantasy season kicks up again. I never thought that practicing a fantasy draft before stepping into it could really help me improve my drafting and come out with better rosters every year. However, as I run more scenarios with Draft Analyzer and use the ADP Draft Planner, I find that I wind up with increasingly better teams. These tools can be the difference between getting excellent value on the sleepers that you’re looking for and reaching or waiting too long, hurting your overall roster. Most importantly, practicing for your fantasy draft can help you develop a strategy for your first few picks that won’t put you in a bind later in the draft. Thinking about taking a top QB in the first two rounds? Mock it. That top TE looking attractive at the end of the first round? Take a trial run first. You may find that while you love that No. 1 QB, drafting the No. 8 player available much later in the draft might leave you with a team you like considerably more. Using the powerful tools at your disposal as a 4for4 subscriber will help prepare you to make the key decisions throughout your draft that will impact your entire season. Still not a subscriber? Join now.